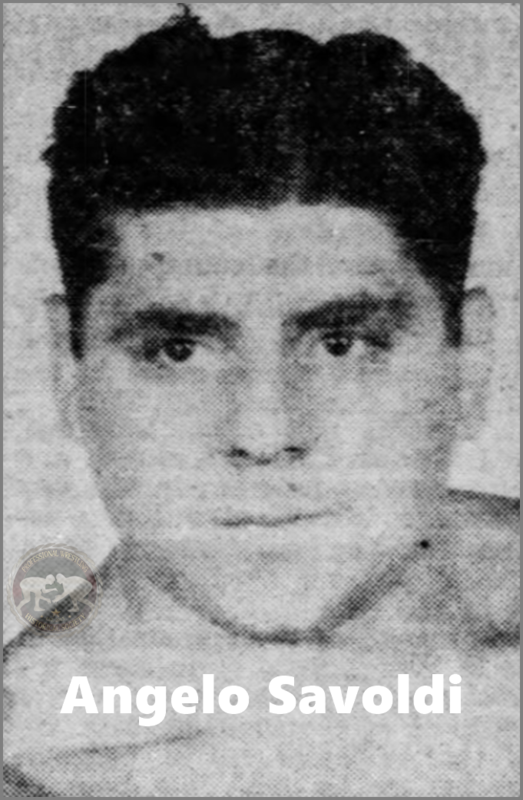 Trained to wrestle at a local YMCA, Mario Fornini got into professional wrestling as a way to try and escape the poverty of the Great Depression during the 1930s. The first recorded bout I have been able to locate was 20 minutes in length against a Bernie Gilbert, which Angelo Savoldi won, the match took place in Windsor Palace, New York City, New York. The infamous Jack Pfefer was the promoter to don Angelo Savoldi with his long standing in ring name during his first year in the business. At some point early in his career he visited Puerto Rico becoming the first American to main event in the country. He also traveled to places such as California, Texas, Boston, Detroit and Tennessee within the first thirteen years of his career among other territories. No matter where he traveled he always went back to the New York and New Jersey area with matches in these territories easily found from 1937 onward. It took until the mid-to-late 1950s for Angelo to find his real fame though. Whilst travelling through Oklahoma Angelo Savoldi adopted the nickname "The Vampire." Under that moniker he won the NWA World Junior Heavyweight Championships on three separate occasions. The first title victory happened in Oklahoma City during February 1958 against Mike Clancy. He held the belt for just a few months as Dory Funk Sr. defeated Savoldi on June 5, 1958. The second title victory was over Dory Funk Sr. again in Oklahoma City. It happened just days after his title loss (June 5) on July 11, 1958. That time "The Vampire" was able to hold onto the championship for a couple of months longer than his first time. That is until Ivan the Terrible defeated him in Oklahoma City on February 20, 1959. Clearly not one to take being beaten lightly, Savoldi won the title back even quicker than he did off of Dory Sr., recapturing the NWA Junior Heavyweight Championship on March 6, 1959 in Oklahoma City. That time he managed to hold onto the golden belt for over a year until finally he met his match in the form of Danny Hodge on July 22, 1960 in Oklahoma City. Leading up to that night and following that night some of the most memorable moments in Angelo Savoldi's career went down. Following a boxing match on May 27, 1960 between Hodge and Savoldi an elderly gentleman stabbed Angelo with a pen knife. It turned out later that the elderly man was in fact Danny Hodge's father who was outraged at the events which had just taken place during the boxing match. He never again reached that level of fame and publicity like he did due to the Danny Hodge encounter. That did not stop him main eventing across North America though as he continued to tour the territories right up until the late 1960s, at which point he pretty much settled in the World Wide Wrestling Federation (Now WWE) and wound down his career there. In 1974 Angelo Savoldi retired from in-ring competition. The last recorded match I can find was on May 4, 1974 where he was defeated by Joe Turco for the WWWF. His retirement did by no means mean he was through with professional wrestling though. As a minority stake holder in the WWWF he was then assigned to training the young up and coming talent. In 1984 he started up International Championship Wrestling based in Boston, Massachusetts along with his three sons Mario, Tom, and Joseph. Angelo Savoldi would strike up an affiliation with the World Wrestling Council of Puerto Rico allowing the usage of their championships and talent sharing among the two promotions. That only lasted until the middle of 1985 though, at that point it was time to create their own championship belts and work on a new arrangement with Championship Wrestling from Florida plus form a solid relationship with the American Wrestling Association. In the latter part of the 1980s to 1990 Angelo Savoldi opened the doors to all promotions working a situation much like the old St. Louis Wrestling Club, however, it was not to last as it appears Angelo stepped out during 1990 leaving his son Mario Savoldi in charge. Angelo trained his sons to wrestle and and his grandson Adam Aarons has also entered into the world of professional wrestling. It seems that Mario Fornini left the wrestling business almost completely when he stopped promoting. He has made appearances since, but nothing long term. Salvoldi passed away on September 20, 2013. Leaving behind thousands of wrestling fans and personalities with nothing but fond memories of the man who was at one time called, "The Vampire."